In a transitive verb phrase, the tense is marked on the subject, the aspect and mood on the verb, and the person and number (of the subject) on the object. In an intransitive verb phrase, the mood and number are marked on the subject, person on the verb, and you just have to guess the other two from context. A script in which the absolute angle of the word encodes important information (say, tone). The culture has a taboo against writing on things that are not perfect circles. So, tomorrow is the 1st of December, i.e. the start of the Lexember month! And as I promised, I will participate by publishing my newly created Moten words on Twitter, Google+, Facebook, and for the first time for me on Tumblr! (with all the Tumblr posts being mirrored on my blog for good measure ;)) And I encourage everyone who is interested to join by creating words for their own conlangs and publishing them with the #lexember tag! I will track this tag here on Tumblr, so as not to miss any of your creations :). You might want to do the same ;). For the entire month of December, every day, once a day, create and publish a new word for one of your conlangs (it’s nicer to use the same conlang throughout, but that’s up to you). The publication should contain the word, its definition, and whatever etymological and usage notes you feel like sharing. Examples are welcome but optional :). Don’t forget to use the #lexember tag on your posts! The created words should be everyday words relevant for the environment where the conlang is spoken (e.g. its conculture, if it has one). The idea is to identify semantic gaps in your conlang vocabulary, and fill them. So no jargon or technical terms, unless they are also used in daily life by your conlang speakers. Slang terms are welcome, but in order not to hurt sensibilities it might be worth warning people in the title of your post when you create such words. The created words should truly be new, i.e. new stems, new derivations and/or new compounds. Just adding a new meaning to an existing word doesn’t count ;). Using other people’s Lexember creations for inspiration is not only allowed, it’s encouraged! (as long as it’s relevant for your conlang naturally :P) As is commenting on other people’s words. This should be a social event :). Don’t hesitate to link to the post that inspired your own creation when you publish it! While the goal is to create and publish one word per day, we all know that December is home to various other social occasions, so it’s understandable if you are unable to publish your creations everyday. In order not to destroy the flow of Lexember, my advice for everyone is to create a few words in advance, and use the queueing and scheduling capabilities of Tumblr to create a buffer. This way, it should allow you to bridge all the festivities without missing a Lexember day :). That’s it. Personally, I will publish each one of my Lexember words everyday at 12PM CET. You’re welcome to use whatever schedule fits you best :). So, let’s unleash our vocabulary creation powers, and fill December with our creations. Happy Lexember! Posted in grammar | Comments Off on Lexember Starts Tomorrow! A conlang in which all consonants are triple articulations. Have a musical language where the topic of the sentence is indicated by a bass drop. Use hiragana for your conlang, even if it is pronounced nothing like Japanese. Heck, it doesn’t need to be a syllabary, make it an alphabet! 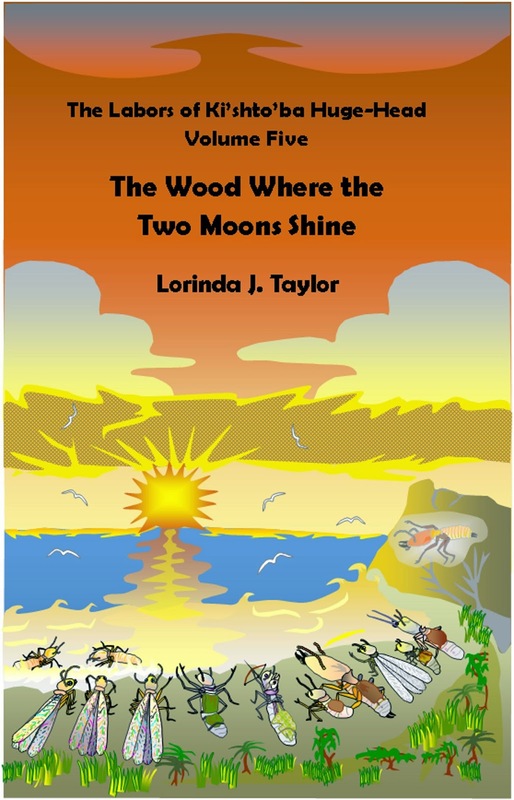 New Review of The Wood Where the Two Moons Shine! In addition to looking up the myths yourself, you can read the posts in this blog in the series "The Life of Hercules," where I talk a good deal about how I adapted the stories. I'd also welcome comments on how you feel about the conlangs. Of course, you'd have to read some of my books first! Okay, if you haven't started with Volume 1 and worked your way through to this 5th volume, you'll have no idea what it's all about. Stop reading the review right now. Go to Amazon or Smashwords and start at the previous two-volume book, "The Termite Queen, Vol. 1" or at least at "The Labors of Ki'shto'ba Huge-Head, Vol. 1" which picks up events after the first book. While an excellent addition to the epic tale of heroic alien termites, I wanted a little more to highlight Ki'shto'ba's quest's end. As the first volume of the story of Is’a’pai’a's search for the golden (fleece) fungus, it's a smooth transition into the young warrior's quest. Yes, this is an imagining of Jason and the Argonauts. Most of the characters in the Greek myth are present and accounted for. But this doesn't need to be a deed for deed, character for character retelling. Some aspects of the Jason myth are impossible. For example, Medea as Jason's wife just won't fit into the story of neuter termite warriors. I suspect a Mother (queen) termite will stand in for Medea at some point. Am I complaining that the epic adventures of Hercules (Ki'shto'ba) and Jason (Is'a'pai'a) are utilized as the basis for the termites' tellings? Not at all. I went to my Dictionary of Mythology to remind myself of the human equivalents to the termite heroes and deeds. My only problem throughout the series is the con-lang (constructed language) Ms. Taylor has created. It's an impressive feat. On the other hand, it's reading a story with all the names and lots of other words are written in Urdu or Finnish. Hard to remember who is who and what is what. I got used to the main characters' names, but new characters and words introduced along the way didn't stick quite as well. This makes the book difficult to read without breaking immersion. The imaginary "translator" of the termite language text, could easily have said "Since the names are difficult, I will substitute more familiar (or shorter) terms to stand in. Please see the Appendix (yes, there is one) as needed." Thus, Ki'shto'ba would be called Kip or Kish, Is'a'pai'a could be Ike or Isa. I would definitely be easier to read. The difficulty of maintaining immersion because of the con-lang dropped a star off the rating [to 4 star]. In all other ways, I highly recommend both series. I look forward to reading Isa's continued quest for the golden fungus in volume 6. Posted in grammar | Comments Off on New Review of The Wood Where the Two Moons Shine! You are currently browsing the Conlangers blog archives for November, 2014.